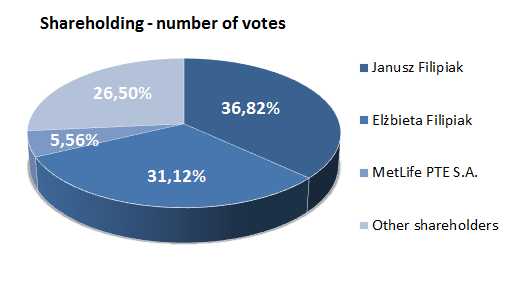 MetLife Otwarty Fundusz Emerytalny (Open Investment Fund) managed by MetLife PTE SA holds 841,097 shares (10.34% of the company’s share capital), which gave her 841,097 votes at the AGM and constituted 5.56% of all votes at the AGM. 7,759 series L1 ordinary bearer shares. The nominal value of one share is 1 PLN.